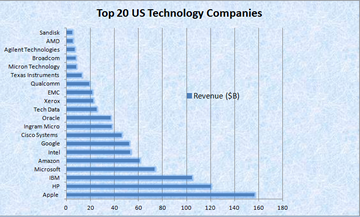 The top 20 US technology companies have 2013 revenues exceeding $878 Billion. The majority of these companies are located in California (12) with the others in Washington (2), Florida, New York , Connecticut, Massachusetts, Texas and Idaho. The revenues listed below, in US $Billions, were excerpted from a Fortune Magazine article published in the May 2013 issue. The complete list of companies can be found on-line at ” 500 Largest US Corporations ” .